Can the Earth Survive the Longevity Revolution? Increased health and life spans may be a dream come true, but many worry that it could turn nightmarish owing to problems like overcrowding, resource depletion, and greater pollution. Living a long time might be wonderful on an individual basis, but if many people can do it, would the world still be a place in which we would want to reside? This is a legitimate worry because both the U.S. and world populations continue to grow. For instance, in 1800 America’s population totaled just over 5 million—that’s fewer people than currently live in New York City. By 2011 that number had grown to over 311 million. Likewise, the world population in 1800 was estimated at around 900 million and by early 2011 the U.S. Census World POPClock estimated that number at 6.8 billion. Of course, during that time the economy changed and living conditions improved significantly, driving up life expectancy by decades. Nevertheless, 6.8 billion is a big number. Can the planet and our societal structures handle any more people? In his Essay on the Principle of Population (1798), Thomas Malthus advanced the thesis that population grows faster than our ability to provide for ourselves and thus will always be checked by famine, disease, and war. Malthus was wrong. Is the Era of the 70-year-old Mom Almost Here? How would family relations change in a world where people live past 100 years in good health? The idea of marriage until “death does us part” comes to mean a very long time indeed. It’s no secret that there is already a trend among young people toward later marriage. After rising precipitously for decades, the median age for first marriage is twenty-eight for men and twenty-six for women today. Undoubtedly this shift is due to a number of factors, including the sexual revolution and better career opportunities for women, but the key has been the increase in life expectancy. In 1850 it averaged around forty-three years, so individuals didn’t have the luxury of waiting around to look for their “perfect soul mate.” The goal instead was to have children early and hope for the best. Now, not only do changes in lifestyle encourage later marriages, the biological imperative to reproduce can be made less urgent by science. New techniques to extend the reproductive functioning of ovaries have also been explored in recent years. For example, in November 2008 the first birth from a full ovary transplant was announced to the public, a promising sign for older women who are unable to conceive owing to menopause, cancer treatment, or other causes of ovarian failure. In this case, a thirty-eight-year-old woman from London who experienced ovarian failure in her teenage years, sending her into early menopause, received an ovary from her twin sister. This procedure could pave the way for more women to have ovaries removed and frozen along with their eggs, to be thawed later on when they choose to have a child. Will There be Class Conflict Over Life-Extension Technologies? I was going to post about longevity and family issues today, but since there were so many comments yesterday about inequality, I decided to post on that issue instead. Again, please remember that as average life span extends, health will extend with it. If you weren’t fully convinced by my short intro post, I invite you to read chapter two of my book (or, if you don’t have time an excerpt of it in the WSJ). Could class conflict or even warfare break out over life-extension technologies? It is true that technology is rarely adopted by everyone at the same time, and when life-extending science hits the market, it will almost certainly be used by the wealthy first. In the early stages of the technology’s rollout, disparities in life expectancy between people within developed countries will surely grow, as will the difference in life expectancy between developed and developing countries. In light of this reality, it should be noted that rather shocking differences in life expectancy already exist, marking an unequal starting point in the first place. Internationally, the gap between the world’s longest lived country and the shortest lived country is a whopping 51 years – almost an entire lifetime. Angola, in South-Central Africa, has the lowest life expectancy at 38.76 years, whereas Monaco, near southern France, has a life expectancy of 89.73 years. The United States ranks 50th, with a life expectancy of 78.37 years. Thank you to those who commented on my first post yesterday! 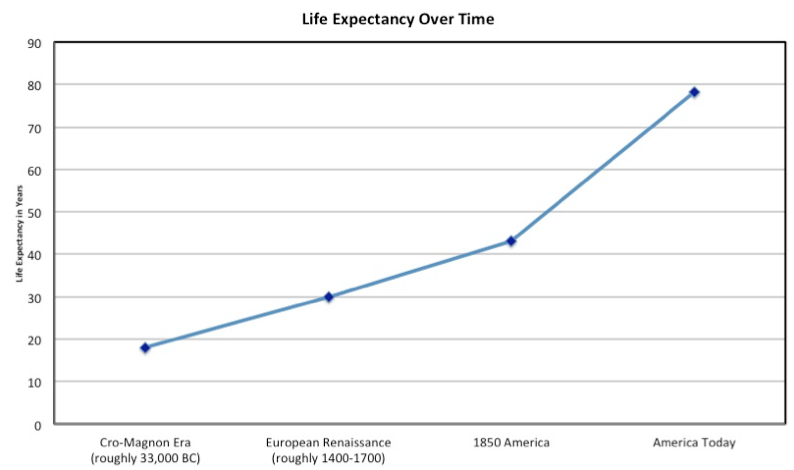 Before I begin my formal post for today, I wanted to make sure I responded to questions about how average life span went from around 18 years in the cro-magnon era to around 80 years today. Tragically, the majority of children used to die before the age of 10 years. This was mainly due to infectious diseases, poor nutrition, and sanitation problems. Discoveries such as antibiotics, vaccines, vitamins and indoor plumbing led to humanity’s rapid gains in life expectancy. What this means is that, for most of history, gains in human life expectancy were made at the beginning, not the end of life. It is true that older people have always been part of society, but they were less numerous and more weathered than today’s seniors. As life expectancy rose, so did the number of older people, and that was when chronic diseases such as heart disease, cancer, and Alzheimer’s made their way into our common vocabulary. But that is not the end of the story. Rather, it is the beginning of a new chapter where humanity takes on ill health and death at later ages. Indeed, those efforts have already had an impact on the growth of life expectancy. Historian Jim Oeppen and demographer James Vaupel point out that “in the second half of the 20th century, improvements in survival after age 65 propelled the rise in length of people’s lives.” There is more on this in chapter 2 of my book, so instead of taking more word space here, I would refer you there to read more. Thanks to Eugene for inviting me to guest blog this week about my new book 100 Plus: How the Coming Age of Longevity Will Change Everything, From Careers and Relationships to Family and Faith. As you can see from the chart above, humanity has made great progress in extending average human life span, and much of that progress happened in the last century and a half. But that is only the beginning. New technologies will continue the extension at an even faster rate. In my book, 100 Plus, I make the argument that, because of advances in regenerative medicine and biotechnology, it won’t be long before humans will be able to extend their health spans to over 100 years. Notice that I don’t simply use the term “life span” but instead discuss “heath spans.” That is because health will be extended along with life. How will this longevity revolution affect society? That is the subject of the rest of the book. I take the position that a health span of 150 years is achievable and base the rest of the social, economic, and cultural analysis on that horizon. Biology has now become an engineering project. Just as computer programs have 1s and 0s, so too does the human body have a code, made out of the ACTGs of DNA. Now that the human genome has been sequenced, work continues on figuring out how to reverse engineer the human body.